Darlings! Oh how I adore an evening at the beach, sipping prosecco and sitting around a bonfire with friends. Those chilly summer nights have me pondering that fashion dilemma we all face: how to make a smooth transition into fall. No one wants to be perspiring, wearing velveteen on a warm September day, and some summer looks appear terribly wrong when the weather begins to shift. I’ll let you in on my favorite transitional piece that you may already own. Why it’s a pair of white jeans, Darlings! They are the ultimate seasonless wardrobe staple. If you didn’t already know, white jeans, like the ones I’m wearing from J Brand, are so versatile and ideal for any casual or dressy look. Crisp and clean, these jeans will make any ensemble pop! My dear fashionable friends, if you are over 50, then it’s high time you wore them! Fashion rules are meant to be broken, and this rule’s stuck with us since we were little girls, for goodness sakes! Why even Emily Post has changed her tune! Do you remember that scene in the movie, Something’s Gotta Give, when Jack Nicholson asks Diane Keaton, “What’s with the turtlenecks? I mean, it’s the middle of summer.” Her reply was, “Well I guess I’m just a turtleneck kind of gal.” Didn’t she look sensational in her cream sweater and white jeans? My cotton turtleneck is from Land’s End and is perfect as a transitional piece. The cream and white combo is a fresh look and is ever so chic. 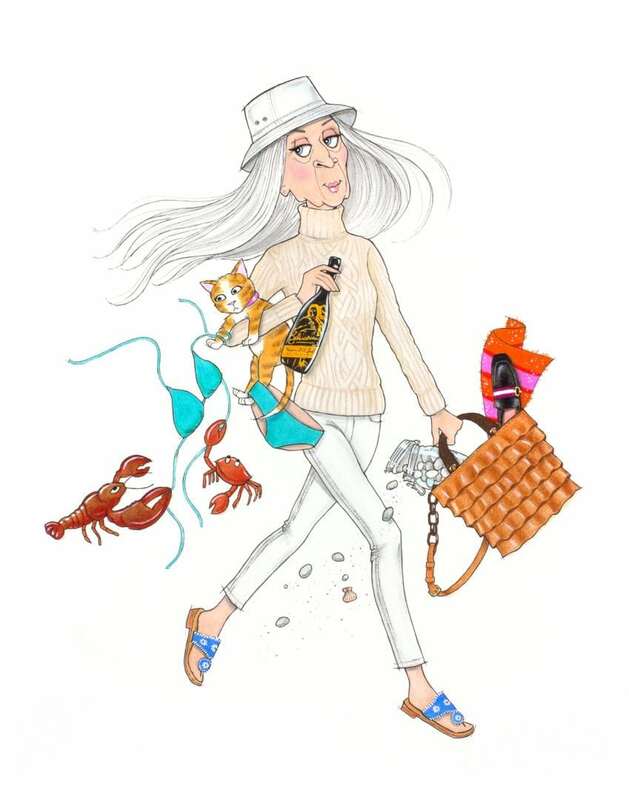 My Jack Rogers sandals are a summer classic you’ll wear for years. If I swap them out for a pair of Bally Livilla Loafers, I’m going from late summer beach combing to apple picking in the fall. It’s that simple! Now add a black leather jacket and heeled boots, and you’re looking fabulous for those chilly months ahead. Try a pointed toe kitten heel and statement earrings for an easy, elegant dressy look. A tote bag is so easy in the summer. I can carry a swimsuit, a jar of organic honey from the farmer’s market and a bottle or two of Bellissima. I do adore a bag that can carry all my essentials (wine) and look great for fall, too. With it’s soft, buttery brown leather, this Michael Kors Stanwyck tote adds just the right amount of lux to any ensemble. So my Darlings, don’t store those white jeans away until next summer! Post Labor Day, wear them with confidence, knowing you look hip, cool and ever so stylish! Emily Post would be proud! Hilda, I’m so glad you like Ms Hildie and her advice this month! Always thrilled to meet new friends! Hildie and I adore your name too! YOU MY DEAR are SO SPOT ON!It has been drilled into us since WE were little GIRLS!!!! !NO WHITE AFTER LABOR DAY!!!! I am in NORTHERN CALIFORNIA so SEPTEMBER and OCTOBER are our BEST MONTHS!!!!!! They call it an INDIAN SUMMER HERE………. OF COURSE we should be wearing white and as for TURTLE NECKS I ADORE THEM!!!!!!! MAYBE you can HELP ME……..for years I have been looking for a TAUNT TURTLE neck THAT GRABS MY NECK!HARD TO FIND! I met The PRINCESS MICHAEL OF KENT once and she had on the perfect one!!!!!! !WE were too BUSY chatting about her SOLD OUT BOOK that I did not get a chance to ask her WHO’s it was………..she did however tell me I could find the book on AMAZON and I did for $3.00!!!!!!!! !She also told me to “SEND IT TO THE PALACE’ and she would sign it!!!! !YOU see I stood in a long long line to get her autograph and the person in front of me got the LAST ONE!SO, WE HAD THIS MARVELOUS CHAT UP!!!!!!! !I had NO IDEA she lived at KENSINGTON PALACE!!! !Well, I got the book wrapped it up and sent it OFF to her expecting never to see again!DID YOU HEAR MY SQUEAL when I got my MAIL!!! !A package from the ROYAL MAIL had arrived with a note and her signature……………….she gets SLACK for being THE BLACK SHEEP of the FAMILY but she REALLY was a LOVELY LADY. OH, a bit OFF TOPIC!!!!!! OFF TO CLICK ON YOUR TURTLE neck choices!!! THANK YOU and perhaps you can be like THE PRINCESS and send me your PHOTO?????? My Darling Contessa, you are a hoot! I adore following you on IG and your fabulous blog! As far as the turtlenecks go, I knew a woman years ago who used body glue, whatever that is, to keep her turtlenecks clinging. Now, that’s a bit much, but, maybe she was on to something. It’s probably something they use on movie sets I would imagine. I’m sure there are some Project Runway like tricks for keeping those necks snug! Now, that silly rule, no white after Labor Day, we have got to shed that once and for all! I too, have been one of it’s many victims! Illustrating Hildie is helping me work through all of that! I pledge to wear my white jeans after Labor Day! Say it with me Darling! I hope the Princess wears her whites in colder months! It is such a chic look! Thank you my dear, I enjoyed that! Hi Doreen. I love them too! Yes, keep wearing them! I just started wearing mine last year. I was seeing so many images on blogs and Instagram, of white jeans paired with sweaters, boots and jackets. Such a casual chic look! When I was thinking about how to dress Hildie for late summer, I thought of how great Diane Keaton looked in her sweater and white jeans. I’m going to be wearing mine in the snow too! I couldn’t agree with you more! I wear white year round and it does lift your spirits and keeps things fresh. I so admire your illustrations, your talent is amazing and done with such a great sense of humor and style!! My Dear Cherie, I am such a fan of your style! Thank you so much for your kind words! Keep wearing that white!!! Dear Katherine, Thank you my dear! I hope I inspired you for fall!